How Often Should You Cut Your Dog's Nails and How Short? How Often Should You Cut Your Dog’s Nails and How Short Should They Be? Just like a human’s nails grow, so do your dog’s nails, and this can cause issues if you don’t clip them regularly. But, how often should you cut your dog’s nails and how do you cut them properly to avoid injuring your dog? These are all common questions that people ask when they add nail cutting as part of their grooming routine, and the answer can vary slightly depending on several factors. 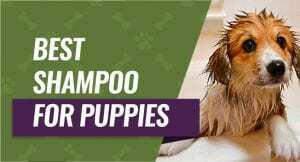 However, most dog nails will loosely follow our guideline, and we’ll also tell you how to cut your dog’s nails, what could be a few potential issues, and common problems that you may encounter. 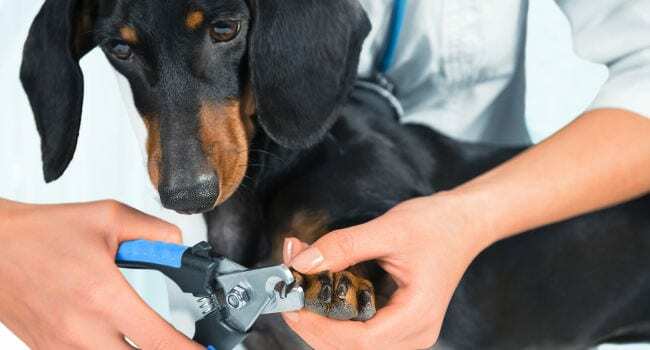 Although factors will come into play when you’re trying to determine how often to cut your dog’s nails, most dogs require a nail trim every four to six weeks to keep them at a healthy length. It’s easier to tell if your dog’s nails should get a trimming if the nail itself is white, but not all dogs have white nails, and this can make it slightly more difficult. As a general rule of thumb, if you can hear your dog’s nails tapping on the floor as they walk or run around, they most likely need to have the tips trimmed or filed down. Also, the nails on their front paws grow quicker than the nails on their back paws, so you may only find yourself clipping their back nails every other time you trim your dog’s nails. Activity Level – The more active your dog is, the quicker they’ll naturally wear their nails down as they play or go about their business. So, if your dog is very active and likes to run around a lot, you may not have to trim their nails as often. Age – As your dog starts to age, their activity levels can start to decline, and they may not want to go on walks as much. This can cause you to have to trim their nails more often to prevent them from overgrowing. Breed – Lap dogs and smaller breeds like the Chihuahua who spend most of their time indoors will need more frequent nail trims. This is because they don’t wear them down by themselves, and some breed’s nails tend to grow at a quicker rate than other breeds. Diet – Your dog’s diet will affect how healthy and how quickly their nails grow. Making sure that they have a well-balanced diet can ensure that your dog’s nails slow their growth patterns and continue to grow at a healthy an manageable rate. Indoor or Outdoor – Your dog’s environment will play a key factor in how often you trim their nails because dogs who primarily live outdoors will require less trimming because of natural wear. Indoor dogs usually need more frequent nail trimmings because there’s nothing in your home to wear them down, and your hard flooring isn’t abrasive enough. Nail Length – If your dog’s nails have been growing longer and you haven’t kept them cut short, this means that the quick has also extended more. When this happens, your dog’s nails tend to grow faster so trimming them back every two or three weeks can cause the quick to shrink and the nails to slow their growth patterns. Dogs are a lot like humans, and they can experience anxiety when it comes to introducing new things like nail cutting and trimming. 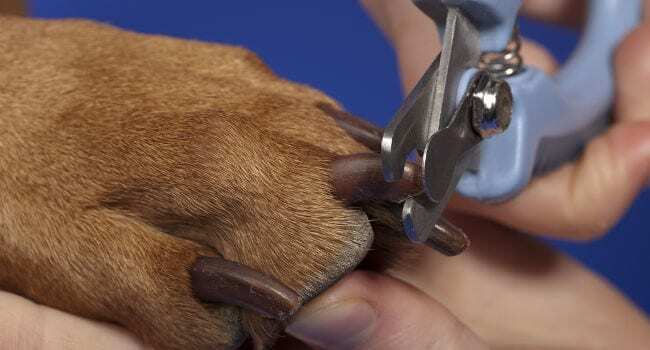 This usually stems from a prior bad experience, and it may take several attempts before your dog will accept the nail cutter anywhere near their feet. Your dog has a quick in their nail bed, and this is a blood vessel that runs to your dog’s nails that is extremely sensitive. If you nick or cut this blood vessel when you’re trimming your dog’s nails, it’ll bleed an cause your dog pain, and this can make them more anxious and afraid of the next nail cutting session. Dogs with dark or black nails are more difficult to trim because you can’t see the quick like you can with light or clear nails. You’ll have to make several small cuts and watch for the nail to change to an off-white color when you trim your dog’s nails if they’re dark to be sure that you get them short enough without cutting into the quick. Speaking softly to your dog, place your left arm around your dog’s midsection and hold them firmly against your chest. Grasp your dog’s paw in your left hand and place your thumb on top of the toe while you use two fingers to support it from below. Insert your dog’s nail into the nail clipper at a 45-degree angle and snip the nail tip-off. If you cut too far and it bleeds, you want to have an anticoagulant powder on hand to press into the wound, or cornstarch works as well. Once you trim their nails, take a file and file away any rough or jagged edges to leave a smooth surface behind. Repeat the process on all of your dog’s nails, including any dew claws. 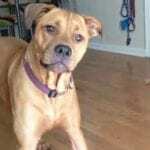 If you’re still not sure or confident about cutting your dog’s nails, this video goes over the entire process one step at a time. This is where it gets a little murky because there is no exact measurement when it comes to trimming or cutting your dog’s nails. Your goal is to take enough off the nail to keep it short enough that it doesn’t touch the ground when your dog walks, but you don’t want to cut it short enough to hit the quick. As we mentioned, dogs with clear or light colored nails are easier to cut and trim because you can see the quick. 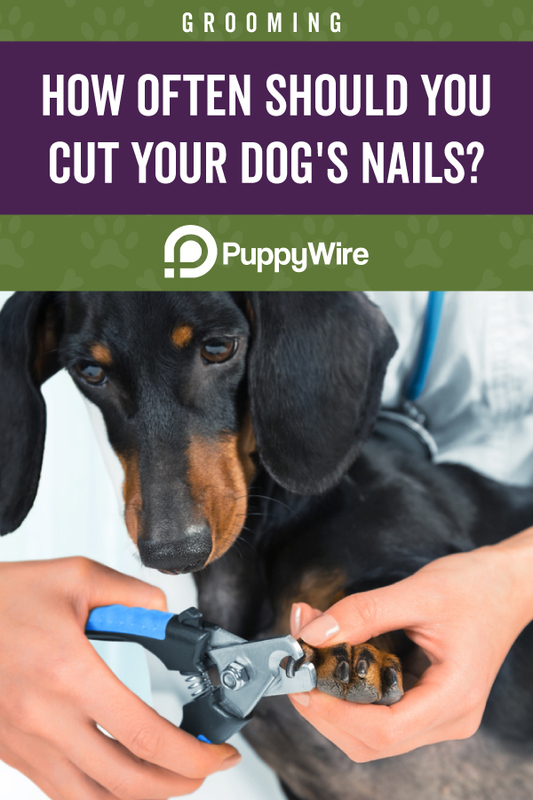 Nails with dark colors require you to go slower and take more small cuts than larger ones, but you simply want to keep your dog’s nails from tapping on the ground as they walk. Infections – Your dog’s nails can potentially grow around and into the pads of their feet. Not only is this extremely painful for your dog to live with, but it also opens them up for infections or other problems. Pain – If your dog’s nails are too long, they can strike the ground each time your dog takes a step. This can jolt the nail and result in a quick feeling of pain that happens every time your dog gets up and moves. Tearing or Splitting – If your dog’s nails are long, they can snag on the carpet and tear or split. 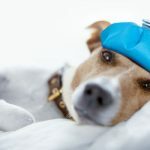 If this happens, your dog can experience pain and not want to put any weight on the affected foot, and it could require a trip to the vet’s office to trim and fix. Reduced Traction – Your dog may adjust how they walk if their nails get too long, and this can reduce how much of their paw pads come into contact with the flooring. In turn, this can lower their traction and make them more prone to slips and falls. Trimming your dog’s nails is a critical part of their grooming routine to keep them happy and healthy. 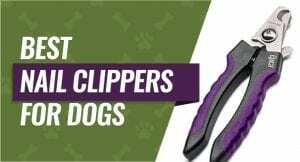 You want to start young and give your dog a lot of time to get used to your nail clippers and nail trimming to ensure that you don’t have any issues and that you can keep your dog’s nails healthy throughout their lives.